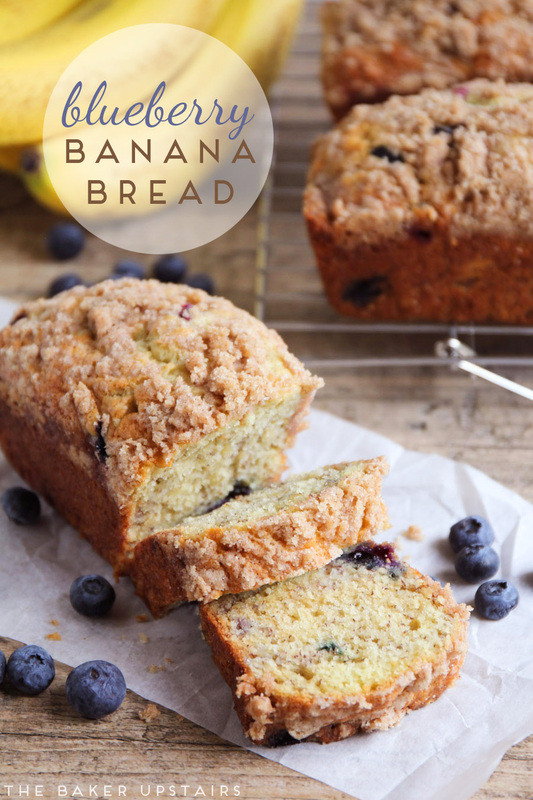 A couple of months ago I shared the best banana bread recipe on the blog, and I have to say, I'm obsessed. I've made it at least three or four times since then, which is pretty rare for me, since I love trying new recipes. It is consistently delicious, and by far the best banana bread I've ever eaten. This last time when I made it, though, I had a bunch of blueberries in the fridge that needed to be used, and I had the brilliant idea of combining the two. Best decision ever! 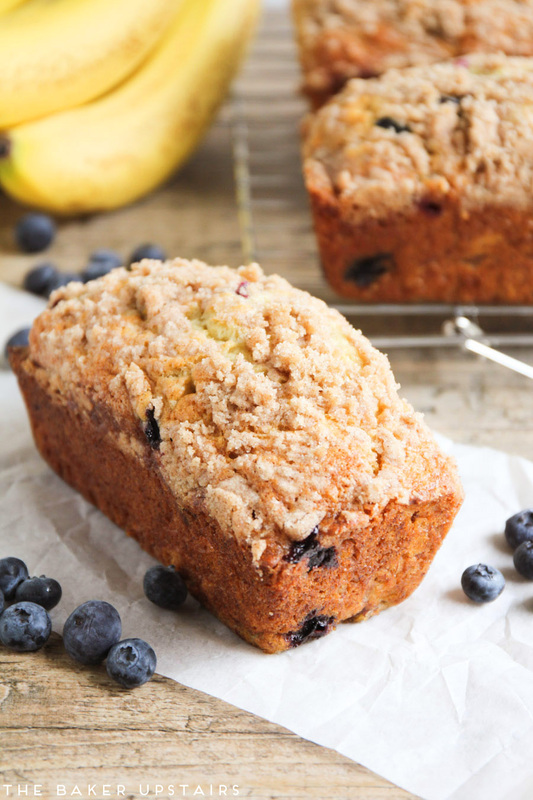 I topped it with a quick and easy cinnamon streusel, and it was incredibly delicious! 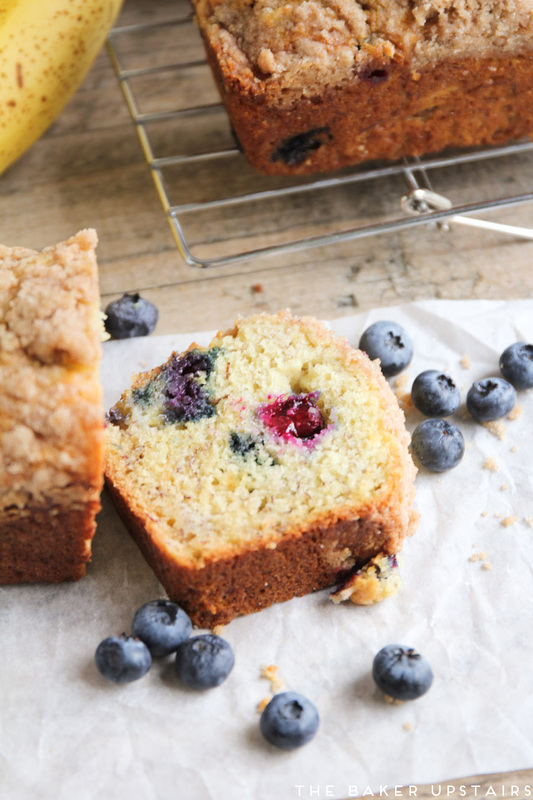 The blueberries are a perfect complement to the sweet, moist bread, and add so much great flavor. And the streusel... so delicious and buttery. I can't get enough of it! This bread is just all kinds of fantastic. Yum! Preheat the oven to 325. Prepare four mini loaf pans or a regular size loaf pan by spraying with cooking spray. In a large bowl or the bowl of a stand mixer, beat together the sugar and butter until light and fluffy. Mix in the eggs, vanilla, and milk. Add the flour, salt, baking soda, and baking powder, and mix until just combined. 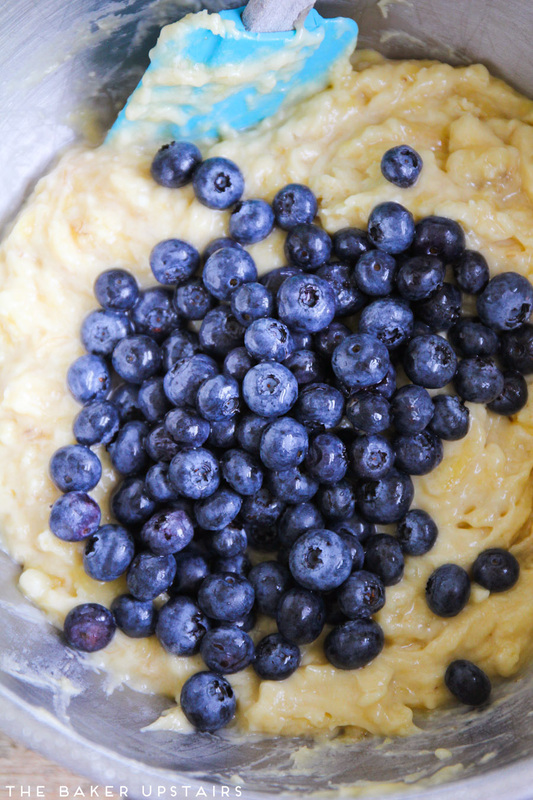 Fold in the mashed bananas, then gently fold in the blueberries. Pour the batter into the prepared loaf pans. To make the streusel, whisk together the sugar, flour, and cinnamon. Smash in the butter using your fingers, until the mixture resembles damp sand. Sprinkle the streusel mixture over the top of the loaves. Bake 35-40 minutes for mini loaves, or 60-70 minutes for a full size loaf, or until golden brown on top and a toothpick inserted into the center comes out clean. Let cool before serving. This sounds so good!! I love your pics!!! Thanks for the recipe! They were so delicious. My family loved them. Thanks for the recipe! They were so delicious!! Just made the bread, and it's delicious! I'm afraid it won't last long in our house, though! Made this today and it vanished so quickly I was amazed - even my daughter who doesn't like blueberries asked me to make it again and I'm not the world's best cook so that was a lovely comment! This is my GO TO bread recipe now!! Amazing!!! I am house/dog/cat sitting for my BFF amd fam. I wondered what to do with the 3 bananas and blueberries. Though my friend is gluten free, I will try to use GF flour. I bet it will be awesome!! What do you think! Did I read the recipe wrong? (quite possible since I was baking with my 5 year old sous chef!) It overflowed my bread pan. Should I have used 2? I haven't tasted it yet but it smells delicious! Hmm... I guess it would depend on the size of your pan. My bread pans are 8.5 x 4.5 inches and I haven't had any problems with batter overflowing. This recipe is amazing! Thank you for sharing.